He was born in Gary, Indiana, in 1915. He received the degree of Bachelor of Arts from Chicago University in 1935, and the degrees of Master of Arts in 1936, and Doctor of Philosophy in 1941 from Harvard University. He was a Social Science Research Council predoctoral fellow from 1935-1937, a member of the Society of Fellows, Harvard University, 1937-1940, and a Ford Foundation Research Fellow from 1958-1959. He received honorary Doctor of Laws degrees from Chicago University and Oberlin College in 1961, and from Indiana University and East Anglia University (Eng.) in 1966. Even while a graduate student at Harvard, he had already won international renown and had made significant contributions to economic theory. Confronted by contradictions, overlaps, and fallacies in the classical language of economics, he sought unification – and clarification – in mathematics. In his first major work, Foundations of Economic Analysis, published in 1947, he demonstrated that this approach worked. He told economists that they had been practicing “mental gymnastics of a peculiarly depraved type,” and that they were like “highly-trained athletes who never run a race.” He was not claiming mathematics as the cure-all or end-all of economic analysis, but he was insisting that mathematics was essential to an understanding of what economics was all about. He was co-author of Readings in Economics, published in 1955, and has co-authored numerous other works in the field. His latest book is Linear Programming and Economic Analysis, written in collaboration with Robert Dorfman and Robert Solow and sponsored by a grant from the Rand Corporation. Mathematical economics is applied to practical problems in international trade, transportation and marketing, competitive strategy in business and government, industrial production, and defense planning. Such complex problems of choice can now be analysed by the mathematical economics which Professor Samuelson has developed. He came to M.I.T. in 1940 as an Assistant Professor of Economics and was appointed Associate Professor in 1944. He served as a staff member of the Radiation Laboratory from 1944-1945, was Professor of International Economic Relations (part-time) at the Fletcher School of Law and Diplomacy in 1945. He was appointed Professor at M.I.T. in 1947 and is now an Institute Professor. He was a Guggenheim Fellow from 1948-1949. Professor Samuelson has served widely as a consultant. He worked for the National Resources Planning Board from 1941-1943 (in charge of war-time planning for continuing full employment); the War Production Board and Office of War Mobilization and Reconstruction in 1945 (economic and general planning program); the United States Treasury, 1945-1952; the Bureau of the Budget in 1952; the Research Advisory Panel to the President’s National Goals Commission from 1959-1960; the Research Advisory Board Committee for Economic Development in 1960. He was a member of the National Task Force on Economic Education from 1960-1961 and has been a consultant to the Rand Corporation since 1949. He is an informal consultant for the United States Treasury and the Council of Economic Advisors. He is also a consultant to the Federal Reserve Bank. He was Economic Advisor to Senator, candidate, and President-elect Kennedy and was the author of the January 5, 1961 “Samuelson Report on the State of the American Economy to President-elect Kennedy.” His consultation for the government has brought him national recognition as an economic advisor. In 1965 he was elected president of the International Economic Association. In his report to President-elect Kennedy in 1961 on the state of the American economy, he wrote: “Various experts, here and abroad, believe that the immediate postwar inflationary climate has now been converted into an epoch of price stability. One hopes this cheerful diagnosis is correct. However, a careful survey of the behavior of prices and costs shows that our recent stability in the wholesale price index has come in a period of admittedly high unemployment and slackness in our economy. For this reason it is premature to believe that the restoration of high employment will no longer involve problems concerning the stability of prices. In this report to President-elect Kennedy, Professor Samuelson made certain minimal policy recommendations “that need to be pushed hard even if the current recession turns out to be one that can be reversed by next summer at the latest.” He urged strong support of pledged expenditure programs, including: increasing defense expenditures and foreign aid on a basis of merit and need, vigorously pushing educational programs, high priority for urban renewal and health and welfare programs, highest priority on improving unemployment compensation, acceleration of useful public works and highway construction programs, help for depressed areas programs, and natural resource development projects. To stimulate residential housing, he recommended reducing mortgage rates, mortgage discounts, insurance fees, and extension of maximum amortization periods, and a step-up in the Federal National Mortgage Association mortgage purchasing program. In monetary policy he specifically urged more reliance upon short term issues (to nudge a reduction in long term rates), and decisive actions to improve our international balance of payments position. Professor Samuelson has been active in a number of honorary and professional organizations. He is a member of the American Academy of Arts and Sciences, a fellow of the American Philosophical Society and the British Academy; he is a member and past President (1961) of the American Economic Association; he is a member of the editorial board and past-President (1951) of the Econometric Society; he is a fellow, council member and past Vice-President of the Economic Society. He is a member of Phi Beta Kappa. He is the author of hundreds of articles in journals and magazines. He lives with his wife and six children (including triplet boys) in Belmont, Mass. 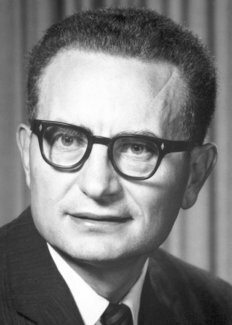 Paul A. Samuelson died on 13 December, 2009.